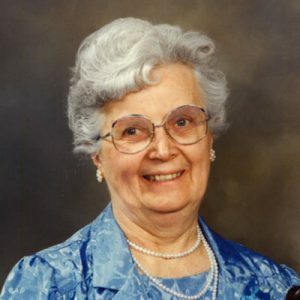 It is with great sadness we announce the passing of Rose Elizabeth Rojem (nee Langhorst) on August 19, 2018. Rose passed away peacefully at Sun Pointe Village with her daughter at her side. Rose was born October 18, 1916 in Humboldt, Saskatchewan and moved to Kelowna in the early 1930s with her mother and sisters. She worked as a waitress at Chapens and then in the Kelowna packing house. Rose met Ernst (Ernie) Rojem and they were married in Kelowna in 1938. They were married for 63 years and had 5 children together. Besides raising her family, Rose was always busy with her hobbies; knitting, photo albums, and needle point. With her family grown, Rose spent the next 50 plus years volunteering at KGH, first in the gift shop, then engraving and next, recycling. CBC did a news piece on her volunteer job when she was 91. Rose spent countless hours serving, as her heart was to help others and not let life get her down. Rose is predeceased by her husband Ernie and four children, Shirley, Kenneth, Clifford and Dennis and survived by her daughter Elaine (Darryl) Frasier, nine grandchildren: Mike Rojem, Steve Rojem, Chemen Rojem, Cindy Mantel, Michele Frasier, Heather Avon, Karen Rojem, Greg Rojem, Caleb Rojem and their families; 10 great-grandchildren: Lindsey Rojem, Curtis Rojem, Jaime Rojem, Taylor Rojem, Katherine Mantel, Kimberley Mantel, Paul MacKenzie, Matthew MacKenzie, Luke Avon and Adanna Avon; many nieces and nephews, and daughters-in-law Darlene and Kathy. Rose will be remembered as a strong, independent woman who loved her family and served in her community for many decades. She will be greatly missed by the many lives she touched. A Memorial Service will be held at 2:00 pm on Friday, August 24, 2018 at Willow Park Church, 439 Highway 33, Kelowna, BC. In lieu of flowers, a memorial donation to the Kelowna Hospital Auxiliary, or charity of your choice, would be appreciated. Memorial donations to the Kelowna Hospital Auxiliary, or charity of your choice, would be appreciated.